This interview originally appeared in Issue One (2012) of The Drummer's Journal. You can read that whole issue, for free, right here. Though you might not realise it, Don Lombardi has influenced the way you play drums. He has done this, in all likelihood, without you ever having heard him play. If you were to Google his name, you’d learn that a man also called Don Lombardi is CEO of a company concerned with Pediatric Innovation. You won’t find any videos of him performing a 10-minute improvisational solo, or see any ads selling his latest instructional DVD or book. It’s also quite likely that, should you feel inclined to check the liner notes of your favourite albums, he will not be mentioned. Yet, had he chosen a different career path, it is likely that the drum set at which you often sit would be slightly more primitive in its design. 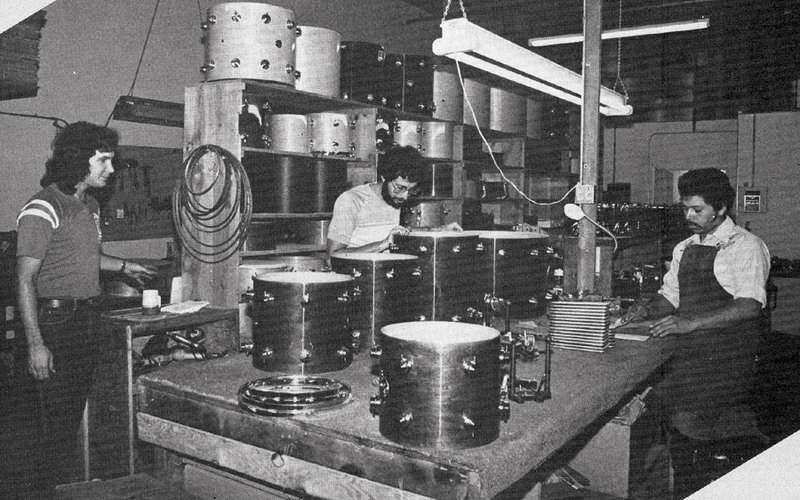 In 1972, Don started a company called Drum Workshop (DW) and would go on to design and patent drums and hardware that would change not only the industry, but the way people could physically play the instrument. More recently, he founded a separate company called Drum Channel. It’s an online tuition service that boasts a faculty so formidable it makes the members of The Dirty Mac look like bumbling amateurs. The Drummer’s Journal: You’ve been a product designer, a CEO, an entrepreneur, a professional drummer and an educator: which one describes you best? I think this is true of many drummers; if I had to fill out a resume and state what I do I would say I play drums. I mean, in recent years, that hasn’t been my career path; that’s not where I’m getting my pay-cheque. I started playing when I was nine. When I was 11 we found a good local pro drummer who was teacher. I bought a hi-hat and became entrenched in playing jazz ride cymbal patterns on it. I didn’t even care about getting the rest of the set. In the early days I studied with Nick Ceroli, then with Freddie Gruber. After that I studied with Colin Bailey, mostly on Joe Morello’s technique. Then, right out of high school, I started playing professionally. Back in those days there was so much studio work in LA. I would never consider myself a studio musician but I did enough studio work, along with travelling and touring with bands, to make a living. I always taught from the time I was 16 onwards. I think because I had good teachers they also taught me how to teach. When my son was born I didn’t want to travel anymore, so I built up 40 or 50 students and consolidated them into my own location to save me a lot of driving time. So, this was the start of DW. How did you take those first steps in starting production? I would have friends and major drummers come in once a month and do these workshops and educational seminars. Shelly Manne, Ed Shaughnessy, Freddie and some more great drummers in the LA area would come in once a month and do a clinic, which was kind of a new thing in those days. But, I still ended up doing a lot of travelling which taught me my first business lesson: If you have your own location and you’re not there making money you still have to pay the rent! So we started doing sales out of there too. John Good, current DW Vice President, was one of my students and he would come in during the day and I traded him drum lessons for his time to run a little bit of a drum shop, which is something I never envisioned getting into. The father of a student of mine owned Camco and he decided to sell that business and sold me all the tooling dies and moulds. My first invention was an adjustable trap case seat in the ‘70s. I always thought it’d be a hobby and that I’d continue as a professional musician. But by the 1980s DW had got so big we had to move to a lower cost area so we moved about an hour and a half out of LA. It was getting to difficult to keep burning the candle at both ends, driving back and forth, so I started playing less and less and then virtually not at all. I was working a seven- day week doing eight to ten hours a day trying to run the business without any outside funding. I was once approached in the late 1980s by one of our competitors, one of the biggest drum companies in the world, and they came over at a NAMM show and asked, ‘who does your marketing?’ I said, ‘we just sit around once a month and come up with ad ideas.’ I don’t think they believed me. They thought I was trying to keep whoever we had doing our marketing a secret. Then I thought, DW doesn’t even have a marketing department, it’s always been me telling a message. I really don’t think you can sell a drummer anything. Fortunately, our competitors look at the business they’re in as solely economics. You’ve got to look at in terms of innovation, and also the fact that our competitors didn’t have their finger on the pulse of what the consumer was looking for. Their goal was to dominate the American drum industry back in the late 1970s and early ‘80s. They saw it as a very labour intensive industry. They were looking at Ludwig, Slingerland and Rogers paying eight dollars an hour when they were paying 60 or 70 cents an hour in Taiwan. They put a lot of investment into it, trying to buy out the market, paying people left and right, doing all kinds of rebate programs with dealers. So over a period of a few years the American companies started struggling and they started being sold off to other larger corporations. Again, that opens up the door to problems. It might give a company more financial strength, but it cuts down your ability to make decisions which are in the best interest of the consumer because the decisions always have to be in the interest of what’s the most profitable. How did others react to DW establishing itself? Basically, in the 1980s, when I started with no money and looked for investment, I was told, ‘You’re nuts. Three American drum companies have already gone under, the Japanese companies are dominating, interest rates are at 19 per cent and you want to start a drum company?’ We weren’t a drum company at the beginning. We made pedals for the first six or seven years, but we didn’t make any money at all. We borrowed a lot and I was still working nights teaching. The thing that financially made us a real business was when we took what had existed as a double pedal and made improvements on it to make it a viable part of a drummer’s drum set. I had a patent that I wasn’t able to protect because I didn’t have the money, but I knew we had something that was unique and would have an impact on the drummers who played it. How did not securing a patent affect the business? When you have a product which is revolutionary, and you have competitors who are 100 times bigger than you, their tendency is to just copy it. You then have to legally go through the expense of protecting your patent. I didn’t have the money to do that so we decided to license them. We licensed Tama, Pearl and Yamaha which allowed them to make a double pedal with the plates under both sides and the universal joints. Speaking from a manufacturing standpoint, what would be the main differences now in being able to produce products from when you started? Painfully, there’s very little difference. On the hardware side, what is particularly exciting is that in the last couple of years we’ve been able to invest in some machinery and modelling equipment where we can, within days, fabricate samples and prototypes to see if an idea is feasible or not. In the past this would have taken months. As far as drums go, they are still handmade instruments and John picks out the shells. We have some machinery that automates a lot of the manual processes such as drilling the holes in the shell. With a CNC machine, it’s always perfect, no mistakes. But when it comes down to sanding, lacquering, buffering, bearing edges and assembly that’s all done by hand and virtually no different to what it was before. The thing we do that sets us apart but creates a huge manufacturing problem is we produce the entire kit at once. Have you toured the factory? Well, we believe that a drum set of four, five, six or 12 pieces is an instrument and so those drums have to speak on their own but also fit in together with the rest of the drums in that particular set. This is where the idea of timbre matching the shells came in. The problem with this is you then have to put that whole set through production. Other companies will do all 10” drums one day then 12” the next then 14” the next day which is much more efficient. If you’re painting one drum set one colour, and you can paint it in 45 minutes but it takes another 45 minutes to clean the gun, clean the room and switch to the next colour of paint, you could have painted 50 drum sets the same colour in the same time frame. It’s a much smaller way to produce a kit, which is often why our lead times are painfully long, but there is no way we can get around that. Compared to the piano, for example, the drum kit is still quite a young instrument. From when you started you’ve seen the drum set change quite significantly since then. Do you see potential for it to change further? There will always be change. We’ve got a couple of bizarre possibilities that we’re experimenting with. In terms of sound quality, four or five years ago I never thought we could get a lower fundamental than what we are currently getting from a DW drum set until we hit on the eggshell and now it’s down nearly two more octaves. The way that you lay up the plys on the shell, the quality of wood, the bearing edges that you put on, again, I’m sure there is going to be developments in those areas. I always wanted to get back into education, and to make it inexpensive and accessible. A subscription to Drum Channel is only a few dollars which is nothing for us here – we’re buying Starbucks lattes for more than that. In other parts of the world, however, if you’re only making 20 dollars per month then it becomes an issue. We want to keep the price down so every student can have access. Does the increasing availability of online content mean drumming, as a potential career, is becoming more achievable than it used to be? Well, it’s give and take. It’s more difficult to be, quote, ‘a drummer’ now, and to make a career solely as a drummer. That still happens of course, just not as much. In order to continue to be successful, all the great drummers, particularly the older guys, take steps toward learning how to compose, how to produce, how to write and have a musical career in conjunction with being a great drummer. Certainly it’s important to be a great drummer, but to make a living at it, it’s important to branch out and be everything that a record company used to be. Whatever income you can get as a professional drummer, you’ll get 10 times that if you can get writing royalties. Making a living at drumming is more challenging but becoming a really good drummer is much easier. At the end of the day, there’s 80,000 channels on TV and nothing to watch. I’d sooner log on and see what the guys on Drum Channel are doing.